Located at the corner of Queen and Carleton Sts., in the heart of Fredeicton’s Historic Garrison District, the New Brunswick Sports Hall of Fame is Where Legends Live! Come in and experience the latest in interactive technology within the walls of splendid 19th century architecture. A fun experience for all ages, make it a family destination and GIVE IT YOUR BEST SHOT, testing your skills in the 5-in-1 interactive virtual sports system – one of a kind in NB! 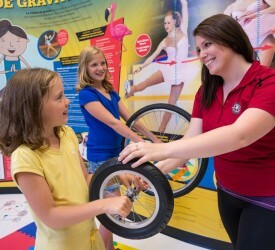 Be inspired as you WALK THROUGH SPORTS HISTORY and enjoy our permanent exhibits and hallways, or HONOUR A LEGEND in our shrine area at the New Brunswick Sports Hall of Fame. You can also find more information on their website and on their Facebook.